In the last few years, Manaslu climbing in Nepal has become quite popular within the 8000 peak dreamers. The most preferred route in Manaslu expedition is North-East route. This is also known as the normal route. There are some excellent reasons behind its popularity. Such as easy access to the Base Camp. Good summit ratio. Active rescue in case of emergency, and of course concerning the price too. 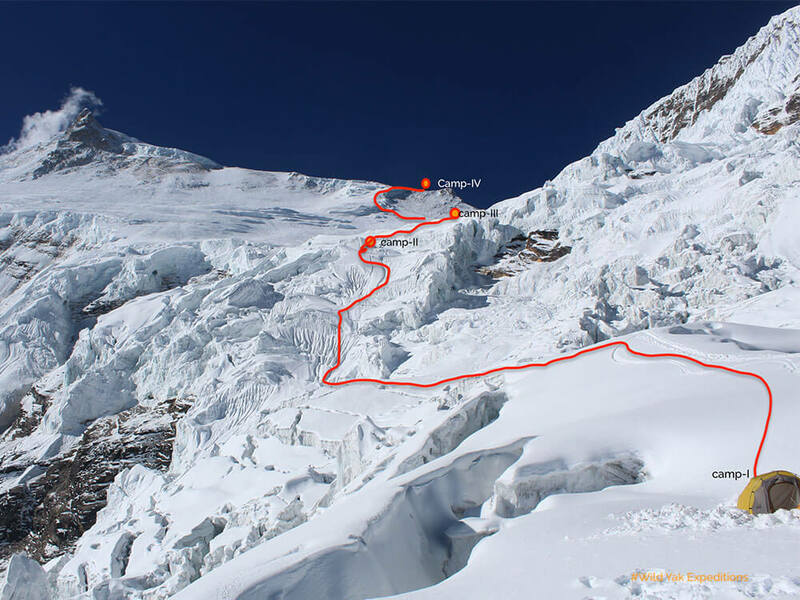 Since the Chinese Mountaineering Association has increased the climbing permit fees by 50%, most of the Cho-Oyu and Shishapangma climbers are attracted to Manaslu as an alternative. I was five times in Manaslu Expedition and summited two times. Here are some personal thoughts about Manaslu climbing in Nepal based on my experiences. Manaslu climbing in Nepal consist of five camps including Base Camp 4,750 meters/15184 ft, Camp-I 5700 meters/18,700 ft, Camp-II 6400 meters/20,998 ft, Camp-III 6800 meters/230010 ft and camp – IV 7450 meters/24,445 ft. In general, if we look at the 14th 8000-meter peaks climbing ratio, Manaslu is not about extreme climbing. But that doesn’t mean it is not a tough mountain. All 8000er mountains are incredibly challenging and retain a high risk of calamity. Besides an excellent preparation of the logistic, Manaslu climbing requires immense physical fitness and excellent endurance capability. On the summit day one must be able to walk 10 to 12 hours between 7400 and 8163 meters. Sometimes weather can be blizzard during the summit day. Manaslu climbing has some crazy and sad stories about climbers who get lost in the wide summit plateau, vanished forever. So, if you are planning to climb Manaslu, I suggest that it is essential to check if the given package includes also accurate weather forecast or not. 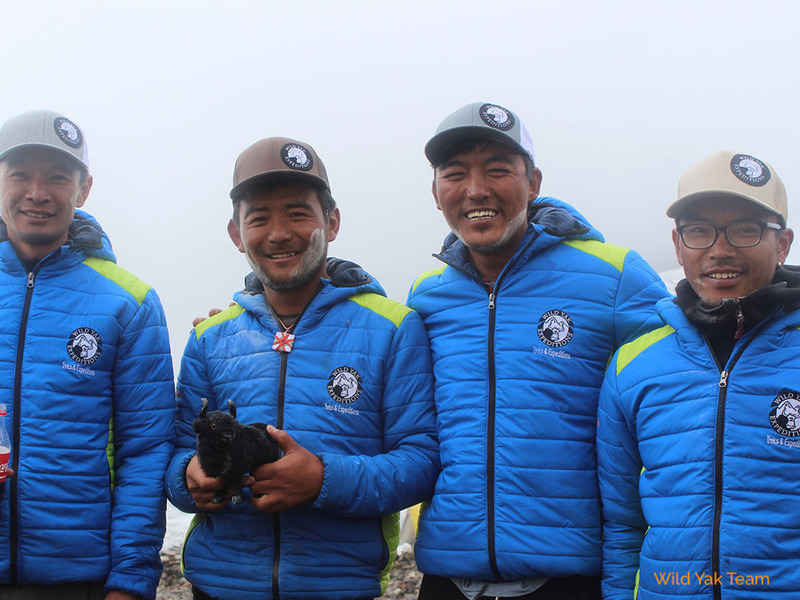 The Wild Yak Expeditions Team receives the forecast from professionals (not by free online provider). This has contributed a lot in our Manaslu expedition summit rate. 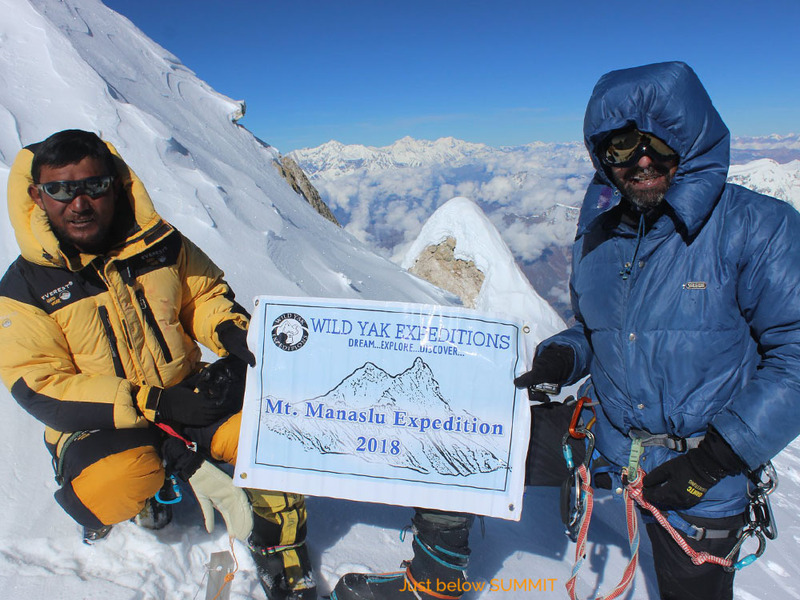 Check the Manaslu climbing program and services included for 2019. Which season is good for climbing? Manaslu climbing in Nepal is utterly different according to the season. I was two times in Spring and threes time in Autumn. What I found that is Manaslu receives much more snow in the Spring than in Autumn. This makes it even harder to climb in Spring than Autumn. 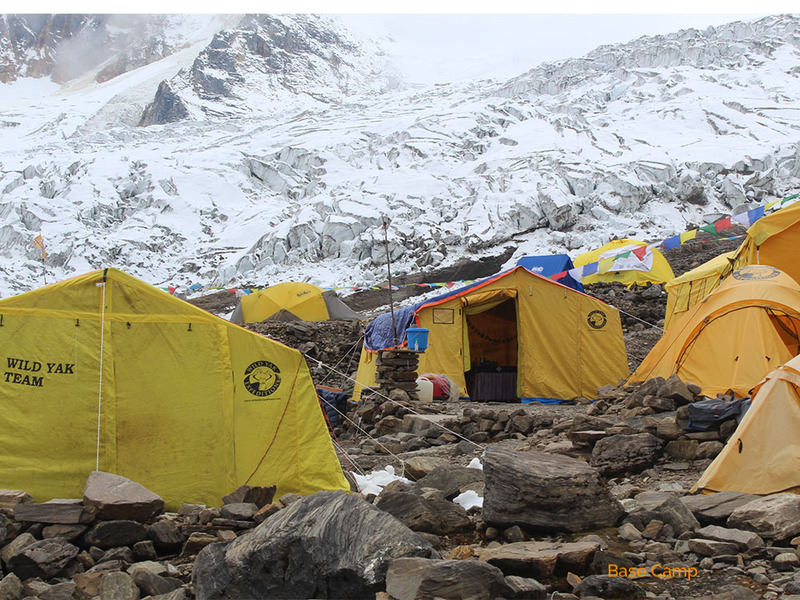 Likewise, frequently covering the tracks, breaking off the tents, lightning, often avalanches around the area creates an exhausting situation. Therefore, I suggest Autumn if you have an option. The Manaslu summit static also shows that most of the summits are in Autumn and very few in Spring. What kind of climbing I will face? Manaslu climbing in Nepal does not require an advance mountaineering technic or training. But it needs a good knowledge of basic climbing and confidence of climbing vertical walls of around 100 meters of 50-60 degrees between Camp-I and Camp-II. It is then followed by a couple of short steep climbing sections. Also, you might confront 5 to 8 meters of ladder walking on the icy fissures with the crampon shoes. This could be a bit stressful the first time. During the whole route the most adrenaline part is thus between Camp-I and -II. The route is plenty of crevasses and icefall with a traverse beneath a gigantic serac hanging above the black rock wall. One should be mentally fit to overcome through this part. What I highly suggest, is to first climb one of the numerous 6000 meters peak in Nepal before putting lots of money and time in an 8000-meter peak. Ascending a smaller mountain will familiarize you with the culture of climbing in the Himalaya. It also gives you a clear understanding of your performances in altitude, which can help you for the future climb. For a good reason, I think that the Island peak is perfect for a first experience. It is a good mixture of glacier walk, vertical wall climbing, slim ridge traverse, 10-12 hours of endurance and sometimes ladder walking as well. 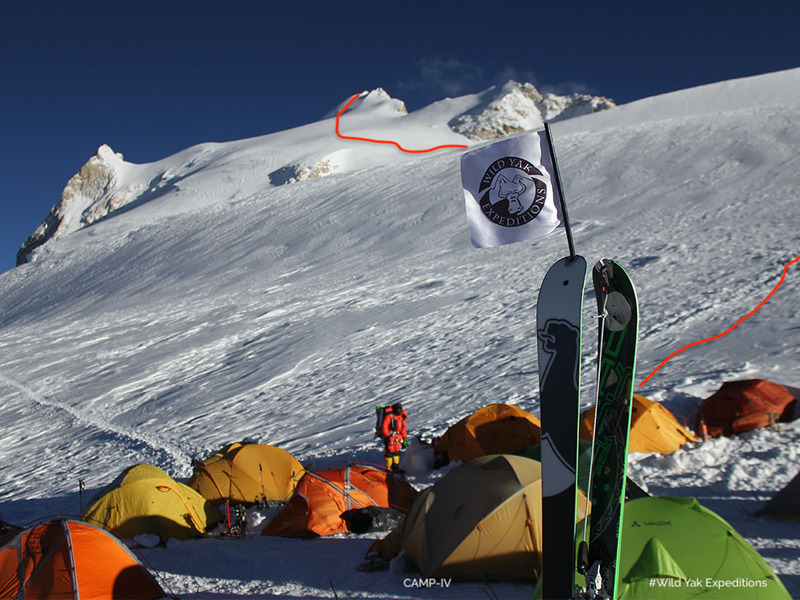 During Manaslu climbing in Nepal, the shortest distance climbing is between Camp-II and -III. It is a straight walking up to the col of Camp-III. The new route is taken more from the right towards the North peak. After the tragic avalanche accident in 2012, the new route is much safer. The route to Camp-IV continues with a straight 30-40 degree climb of 400 meters. 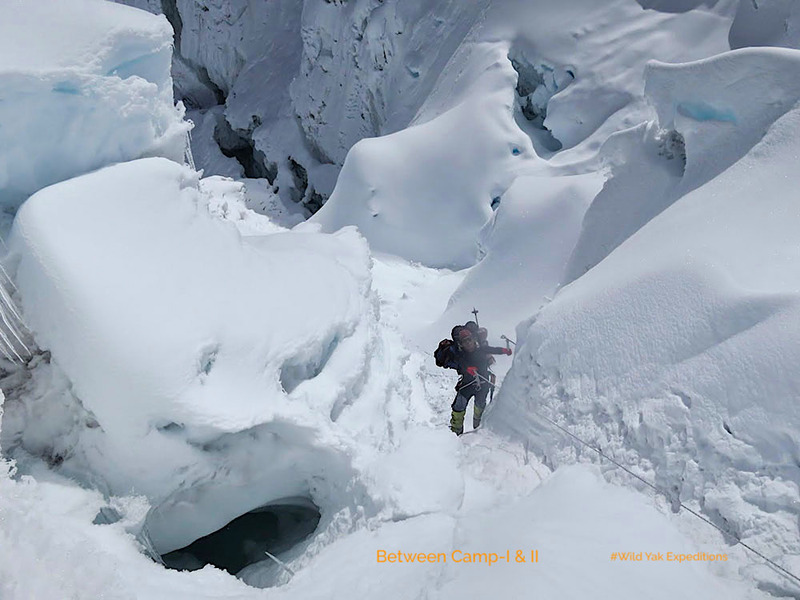 And another 300 meters climbing through icy slops before traversing to Camp-IV. Summit climb is more like a glacier walk, where you need to cross three big plateaus and then 100 meters ascend towards the summit ridge. From the summit ridge, the final climb is on a slim ridge which is approximately 60 meters straight to the top. Only two people can hold on the summit. 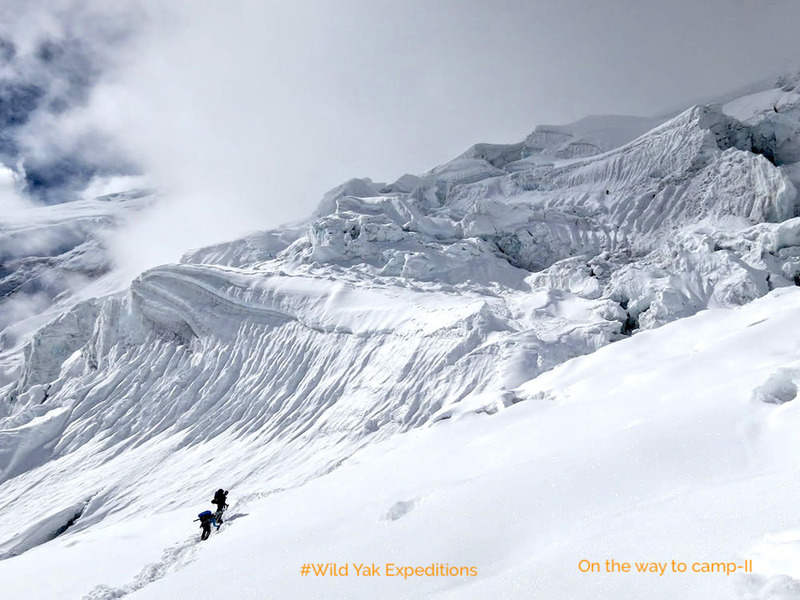 Wild Yak Expeditions confirms its departure for 2019 and 2020 Manaslu Expedition with small group of maximum 6 participants, competent and experienced Sherpa climbing Team. Check out what is new in the service of 2020 and other 8000 meter peaks fix departures.